Partners in the SARE project for 2013 beginner farmer/rancher grant include the tribal communities served by the Lac Courte Oreilles Ojibwa Community College (LCOOCC): Lac Courte Oreilles, Lac du Flambeau, St. Croix, Bad River, and Red Cliff; all located in northwest Wisconsin. Although currently at different stages of sustainable agriculture and food system development, this grant seeks to create more regional actions to improve food security within these communities; while creating educational opportunities that will be scientific in scope for LCOOCC students, educational workshops for community members, and providing greater access to local, nutritious, traditional foods, as well as support traditional Ojibwe subsistence practices. Ojibwe reservation communities in northwestern Wisconsin share the common need of food security. Due to poverty, poor agricultural soils, many health and nutritional concerns, distances to each other, nearest areas of commerce, the loss of knowledge and skills in securing sustenance, these entities are in dire need of projects that will build sustainable living capacities in their respective communities. Linked by culture, traditions, and family relationships; opportunities are needed to address cooperative food and nutrition security issues together while sharing resources, skills and traditional Ojibwe environmental knowledge. The LCOOCC Sustainable Agriculture Research Station staff is working together with agricultural professionals, students, interns, and interested community members at all five locations with educational and experiential opportunities in sustainable gardening/farming practices, such as soil amendment, irrigation, good agricultural management, as assessed as individual or group needs. Educational experiences can be enhanced by including sustainable living practices with traditional knowledge and wisdom. Elders are being approached to share good practices and to provide knowledge about sustenance and healthy living. Community members at each site will have opportunities to learn and share through practical experiences such as: workshops, mentoring, and participating in sustainable living events; also learning traditional and modern preparation and preservation techniques which will allow for year round food security. Each of the five sites will maintain an experimental garden plot to determine yield rates of various traditional foods. This will help determine which varieties grow best in the different climate zones and soil types. The data collected will then facilitate what is grown in year 2 at each community. Historically, the Ojibwe traded foods that were abundant in their relative locations to accommodate items of need; this project will seek to re-establish traditional trade among these tribal communities which was and can be instrumental in developing sustainable regional food systems. LCOOCC student interns were hired to assist the community garden areas at each of the 5 tribal communities. An intern was also hired to coordinate the entire aspect of the project for communicating with all sites, planning meetings and workshops, and collecting data. Relationships were strengthened with the “food” champions within each Tribal community. Supplies were provided to each community to include: plants which were started at LCOOCC, garden carts, hand-washing stations, rain barrels, irrigation supplies, basic gardening tools, and other miscellaneous supplies. Each of the five sites maintained a 30′ x 30′ experimental garden plot to determine yield rates of various traditional foods. This information both anecdotal and quantitiatve assists in preparing garden plots for 2014 growing season. Vegetables grown included the three sisters: corns, beans, squash and other indigenous plants of sweet grass, sage, and tobacco. A garden plot was designed to provide the best locations for each vegetable and relevancy to companion planting, etc. A farm-to-table survey was adminstered in each tribal community. This was done through paper copies collected at health fairs, local clinic, and the community garden site. An electronic version was also sent out to multiple email listservs reaching all communities involved. A total of 139 surveys were received. Data collected from this survey, along with food security data collected on the UW-Madison food security website will be provided to the tribal councils of each community in the spring of 2014. This information will be used to determine the needs for the 2014 growing season. A recap meeting/ after action review was coordinated, along with a seed exchange/swap that took place at the LCOOCC Sustainable Agriculture Research Station in January, 2014. Community gardens and a 30′ x 30′ research plot were designed, implemented and maintained for the 2013 growing season. The harvest was provided to various tribal entities including: Early Childhood Center, schools, Elder Centers, and area feasts. Relationships were strengthened between the tribal communities and between LCOOCC and the Tribes. Supplies were provided to the sites to increase their capacity to grow food and provide that to community members. Workshops were provided in most of the communities; the communities who haven’t had workshops yet had them scheduled but no participants registered. In the future more targeted recruitment will be conducted in this community. Sustainable Living Fairs are planned for the spring or early summer of 2014 in each of the communities. Data was collected from the farm-to-table survey. This survey will be repeated after the 2014 growing season. Outreach: information from this project was provided at area pow-wows, a presentation was given at the 2014 Indigenous Farming Conference in White Earth, MN in March of 2014. Information will also be shared at the 2nd Annual Food Sovereignty Summit in Green Bay, April 14-17, 2014. Community garden/ research plots conducted in 5 tribal communities. Produce provided to community programs such as early childhood center, elder center, etc. A farm-to-table survey was administered and results will be utilized to provide direction for workshops in 2014 as well as provide the data to the tribal communities and tribal councils. Workshops were conducted in most of the communities and more will be provided in 2014. Sustainable Living Fairs are planned for each community for the spring/summer of 2014. Information sharing regarding the project at: Tribal Food Sovereignty Summmit, Indigenous Farming Conference, Intertribal Ag Council, and local venues such as health fairs and pow-wows. 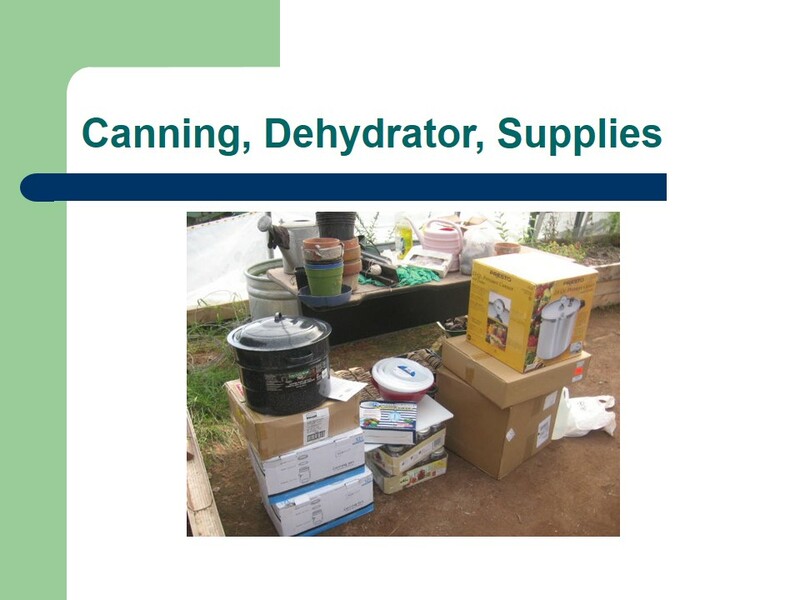 Supplies were provided to each community to increase capacity and included: handwashing stations, rain barrels, irrigation supplies, canning equipment and dehydrators, plants and seeds, along with garden tools, etc.